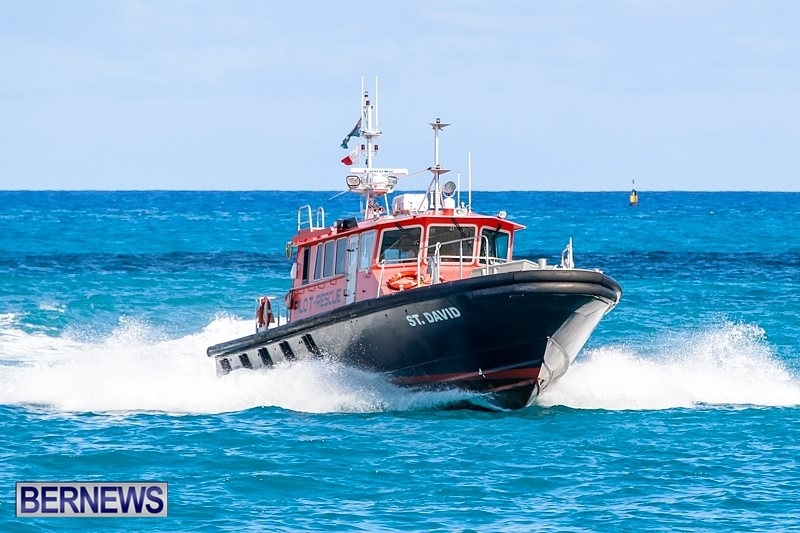 A fishing boat was rescued this morning [Sept 29] after the vessel was rendered disabled with two persons on-board, some seven and a half miles off Bermuda’s east end. The rescue occurred after a distress flare was sighted off Northeast Breaker Beacon. A Bermuda Maritime Operations Centre spokesperson said, “On Saturday 29th September, 8:24am, Bermuda Radio received a call from a local fisherman reporting a Red Distress Flare sighted off Northeast Breaker Beacon. “F/V Shake Down was requested to proceed to the Distress position while pilot boat St. David [Returning from pilot disembarkation at the Sea Buoy], was also tasked to assist. “Bermuda Radio issued an Urgent Marine Information Broadcast [PANPAN] with another vessel ‘Bottom Time’, also responding to calls for assistance. F/V Shake Down was first on scene, reporting that F/V Solace was disabled with two persons on-board, while quickly establishing a tow. “St. David arrived on scene a few minutes later, taking the casualty under tow to St. George’s Harbour, as Shake Down and Bottom Time were thanked for their vigilance and assistance. At 10:12am. F/V Solace was reported safely alongside Market Wharf, St. George’s Harbour. we need to be able fish further out with the same type of reinsurance that they can get the same type of help if needed. Have a Blessed and Safe day. The year 2018, the Island Bermuda. We have no dependable transportation infrastructure, Bus, Ferries, Taxi and Did I mention we are on an Island ? Yes if you become stranded in the open Ocean you will rely on you fellow maritimer to come and bail you out. Other than paying our Taxes for Government payroll where is the money going?